Michelle Adrian painted the picture that received the People’s Choice Award in the 2018 Juried Art Show at the Springfield Public Library. Mrs. Adrian, who teaches art at Springfield High School, was commissioned by Shane Neperman, third-grade teacher in Springfield Elementary School, to make the painting. Shane Neperman is a member of the Sanborn Fire Department, and his father, Tom Neperman, is a member of the Lamberton fire Department. At times they work together when both departments are called to a blaze. Shane wanted a picture of his father with the fire truck to give to him as a Christmas present, and he wanted the picture to be a surprise. Mrs. Adrian worked off photos, and painted Shane in the picture with his father along with trucks from both the Lamberton and Sanborn departments. 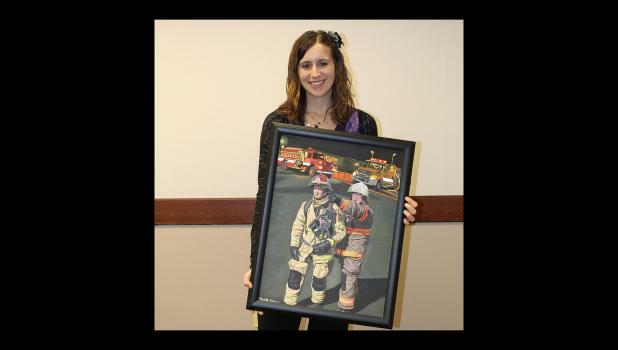 “Following a Father’s Footsteps in the Flames,” is the title of the piece created with acrylics on canvas. “I love painting pictures of people,” Michelle said. “This picture challenged me,” she added. The details on the trucks, the details in the firemen’s gear — the folds in their clothing, the gloves, the blending of colors show the effect of light and shadows, shows the skills of the artist. The Nepermans loaned Mrs. Adrian the picture for the art show exhibit. It was the people’s prizewinner for which the artist received $150 cash prize. The painting as well as pieces by other prizewinners are on display in the Altermatt Gallery, Springfield Public Library, through Saturday, Dec. 20.